If you’ve ever wondered what the phrase ‘talking points’ means, think of it as being the same as riding instruction for jockeys. We all know that politicians use talking points every day. They’re issued from party central and are designed to keep everyone on message throughout the daily news cycle on one or more particular topics. But now as you can see from the first 12 or 18 lines below, cable news channels CNN and MSNBC and the Washington Post and New York Times and their pundits, talking heads and commentariet also have their own, unoriginal, talking points or riding instructions issued from god knows where. They’re incandescent with rage and can barely concealing their self loathing. For years they’ve kept it hidden under a cloak of seemingly mainstream respectability but they can no longer keep it bottled up and have at last stepped out of the closet. Don’t ever expect clear thinking or cool logic from the enraged, unhinged and rabid left, particularly when they’re throwing their toys out of the cot. 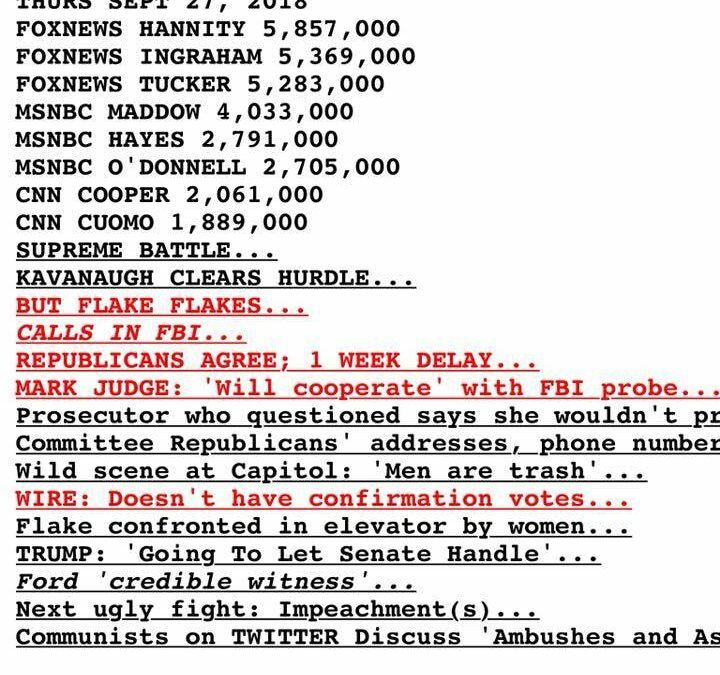 And they wonder why they’re floundering and their ratings tanking with Fox News blitzing them all as the Drudge Report from Thursday indicates. No one cares or is interested in anything they have to say.